Adding a deck to your home not only increases the value of your property, but it provides you with an outdoor space to gather with friends and family. 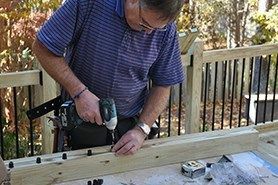 Whether you’re planning to hire a professional contractor to build a new deck or are taking the DIY route and building a deck yourself, there’s a lot of planning involved. To help you get a better ideas of the quantity and cost of materials you’ll need, as well as measurements and specifications to build your deck according to a plan, we’ve created several deck building calculators. These decking calculators will help guide you through the process of building your deck, giving you access to design plans, estimations for materials, and more. Starting from scratch? Check out our free deck designer software or choose from free pre-made plans to build your brand new deck. Each plan includes a list of materials you’ll need. Have questions? Get in touch with us! We’d be happy to answer your questions. Or, if you’re looking for a professional contractor in your area, we can help you get a quote to build your new deck -- no matter how big or how small your budget.